Businesses nowadays are becoming more competitive, more proactive, and more complicated. The environment has certainly shifted and there have certainly been highs and lows in the industry. With the stiff competition comes a definite rise in terms of operating and overhead costs, and this has become a burden towards many businesses. This has also made business owners realize that they need to find new ways and strategies so they can use their resources more efficiently while still retaining their competitive edge in the market. 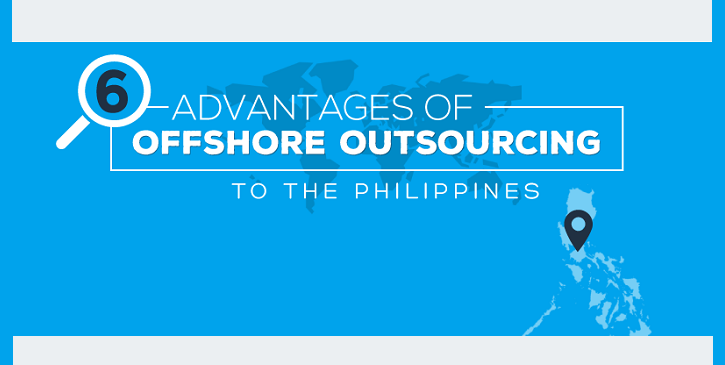 Let's check out the informative Infographic based on Top 6 Advantages of Outsourcing and Offshoring Business Processes to the Philippines. Over the years, a certain option has become more frequently-considered and has certainly grown in popularity: offshore outsourcing – a type of business process outsourcing (BPO). This gives business the option of outsourcing some of its tasks, roles, and processes to a BPO company in another country who meets the company’s requirements in terms of expertise (often times needing to be equal) to save a significant amount of costs and still retain focus on the core functions of the business without compromising the quality of the outsourced jobs/tasks. A country that is well-known for its BPO industry is the Philippines, and it is one of the biggest factors contributing to the sudden rise of the country’s economic growth in recent years. The country has a steadying growth of new BPO companies that are all working to provide its clients with the kind of service they are looking for. Following Infographic has been provided by Global Outsourcing AU. Cheap labor and overhead costs – Outsourcing to the Philippines can cost as low as 50% of what you would normally pay to a regular employee. Excellent communication skills – The Philippines has one of the highest English proficiency levels in the world, beating other outsourcing destination countries like India and China. This is attributed to the fact that the language is a vital part of the school curriculum, and thus, many have been trained and have been speaking English since they were children. Quality talent pool – With its literacy rate on the same level as progressive countries such as USA, UK, and Canada, the Philippines certainly boasts a large pool of working-aged, educated, English-speaking talent, as approximately 90% of their population is under 50 years old. Culturally compatible with western countries – Being under the influence of Spain and the US before becoming an independent country, many of the Philippines’ cultural aspects have roots in Western influences, which makes it easier for them to assimilate into the culture of their clients. Exceptional work ethic – Most Filipino workers are known to be friendly, hospitable, accommodating, and empathic – both in the workplace and in person. Strong government support – Several laws in the country have been passed to protect the welfare and safety of BPO professionals, along with a Council founded to formally regulate and protect the BPO industry in the country.